Relics Of The Space Race, School Planetariums Are An Endangered Species : NPR Ed Once, there were more than 300 of them in schools around the country. Many are still around, but they're getting old. Schools have a choice: Keep the stars shining, or turn the lights out. "It's like the sky meeting a movie theater," says 17-year-old Sahaj Sharda, a senior in Hennig's advanced astronomy class. "When you first sit down and the lights turn off and you just look up, it seems so realistic." Once there were more than 350 planetariums like this one in schools around the country. But now their numbers are shrinking. They're getting old, and so schools have a choice: Keep the stars shining, or turn the lights out for good. To explain how Hennig's high school, and hundreds like it around the country, got a planetarium in the first place, you have to look not into outer space, but back through time. And over time, schools have had to decide to either pay for expensive upkeep, or get rid of the planetarium all together. On Oct. 4, 1957, the faint beepings of a small metal sphere marked the launch by the Soviet Union of the first man-made satellite into Earth's orbit. It freaked a lot of Americans out. And Congress, too. One man in particular saw in Sputnik an opportunity. Stewart McClure was the chief clerk on the Senate's education committee. In his efforts to win more money for schools, he had seen several finance bills die. Now he had a powerful new angle: Link education to national defense. "It was the first real shot in the arm here for the space race growth of planetariums in the coming decade," says Jordan D. Marché II, an astronomy lecturer who has taught at the University of Wisconsin, Madison. There were other planetariums before Sputnik. Chicago's Adler Planetarium was the first in the U.S. when it opened in 1930. And there were a few after that, but the projectors were too expensive to see widespread use. Until Sputnik. By 1970, the U.S. had 729 planetariums. Over half were in public K-12 schools, the majority constructed with NDEA funds, including the one here at Thomas Jefferson High School. 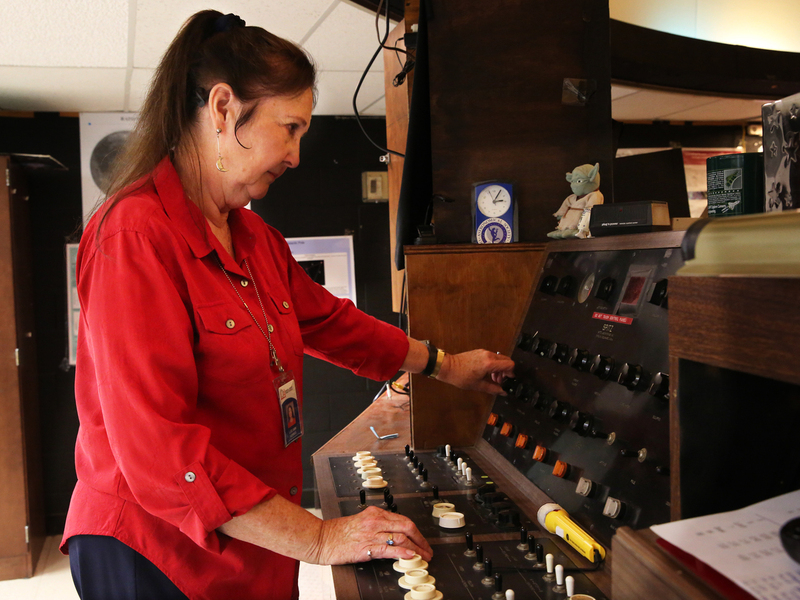 It's been running nonstop since 1967, and Hennig has been its operator since 1988. She started teaching in school planetariums in 1969. But inside, she has the night sky at her fingertips. Hennig's students will see the eclipse on the dome — better late than never. 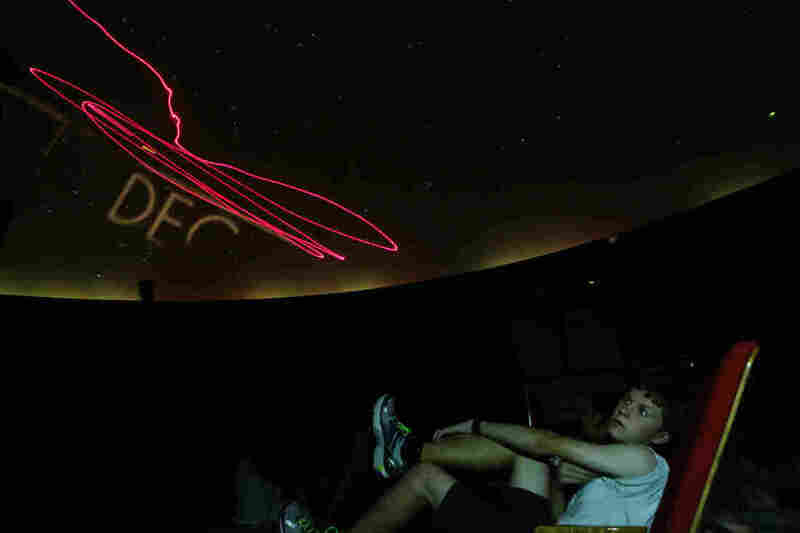 The 1960s projector has its limits, so in a few months, Hennig's planetarium is going digital — and the school will be able to do a lot more than astronomy. With digital projectors, you can explore not only the very large but also the very small: from galaxies to plant cells. Not every school can afford that. Back in 2005, when Rob Webb was hired as a physics teacher at Pequea Valley High School in Lancaster, Pa., the school wasn't using its planetarium. He brought that one back to life, but he says the domes just aren't valued anymore. "The thing is, they're not cheap," Webb says. And with all the academic pressures on schools, he adds, teachers are focused on "making sure that we're passing the tests and fulfilling our requirements and not spending a whole boatload of money." And he worries that without planetariums, too few students will reach for the stars. A version of this story was published on NPR Ed in November 2015.